MARGARITA ISLAND - Venezuelan President Nicolas Maduro told world leaders at this weekend’s Non-Aligned summit that his country was being lashed by a US economic war aimed at ousting him. 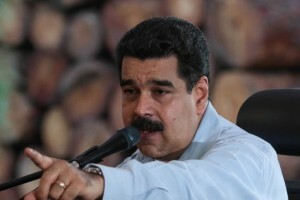 “Venezuela is facing an onslaught… that is against all of Latin America and the Caribbean, that is trying to re-impose and recolonize the politics, economy, culture and life of our countries,” Maduro charged in his speech after taking over the movement’s rotating presidency from Iran. Iranian President Hassan Rouhani, Palestinian President Mahmoud Abbas and Cuban President Raul Castro were among leaders from the 120-nation group who gathered for two days at Porlamar on Venezuela’s Margarita island. The Non-Aligned Movement was founded in 1961 to represent countries resentful of being squeezed in the power struggle between the United States and the Soviet Union. While Maduro’s allegations about a purported international conspiracy to topple him are not new, the Venezuelan leader appears keen to recast the Non-Aligned movement as a bulwark against re-colonization, according to analysts. Maduro maintains that the United States is working with conservative local interests to oust him, as the Venezuelan opposition seeks to remove him from office with a referendum. Speaking at the summit, which opened on Saturday, Maduro’s closest regional ally, Cuban President Raul Castro backed Maduro’s allegations and voiced dismay at the US failure to end its embargo on Havana. Castro said that regional allies would derail “subversive and meddling” US plans, but gave no details. Meanwhile, Venezuela, an OPEC member and home to the world’s largest proven oil reserves, will seek backing for its campaign to slash abundant global crude production in a bid to raise prices. Ecuadorean president Rafael Correa, whose country is the smallest member of OPEC and who supports the Venezuelan aspiration, said the oil cartel runs the risk of falling apart over differences on market strategy. Correa, Castro, Maduro, and Bolivian President Evo Morales all slammed the recent impeachment and removal of Brazil’s ex-president Dilma Rousseff. The host country is beset by an economic crisis caused in part by falling oil prices, and resulting in severe food shortages, outbreaks of looting and riots. The crisis is the biggest threat yet to Maduro and the socialist “revolution” launched in 1999 by his late predecessor, Hugo Chavez. Venezuela’s opposition is pushing for a referendum to unseat Maduro by the end of the year, and polls indicate that the president would lose by a sizeable margin. But his opponents say electoral officials are dragging their feet to protect him. The opposition held fresh protests on Friday after the authorities delayed announcing the timeline for the next step in the referendum process for a second time.